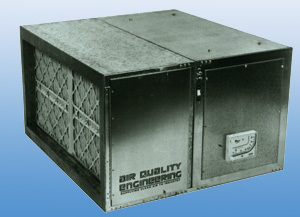 Air Quality Engineering offers several different types and sizes of ambient air cleaners. We manufacture general air filtration systems that utilize electrostatic precipitator technology, multistage mechanical filters (including, but not limited to HEPA filters) and self-cleaning, reverse pulsing cartridge style dust collectors. All ambient air cleaners and dust collector systems from AQE are designed with the appropriate motor/blower combination and filters to provide the optimum balance in high quality components, low initial purchase price and low operating costs to create the best value. 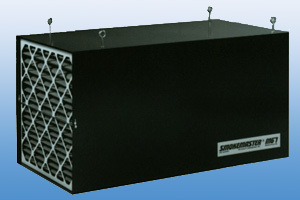 Largest, overhead industrial media filtration system. This is the largest media system we offer. Small industrial media filtration system. Can be ducted or used ambiently. Small industrial portable source capture system. Ideal for small welding applications. What is Ambient Air Cleaning? Ambient or background air cleaning refers to applying air cleaners to generally clean the entire air volume of a room or building. This approach is frequently utilized when it is not possible to link the filtration system to a specific process or to a specific location. Examples would include facilities such as large warehouses where it’s not possible to identify an individual source or in facilities where the contaminant generators are highly mobile such as portable welders. How do I select or size the appropriate ambient air cleaning system? The most important factors when selecting the proper ambient air cleaner are the cost per cfm of delivered airflow and the square footage of media. Some manufacturers advertise the “free air” number (sometimes without indicating this is the “free air” rating) as opposed to the delivered airflow. Also, just as important is the type of blower utilized – a forward curved blower can not retain airflow against a significant rise in static pressure. A backwards inclined blower wheel will be more resilient in airflow as the filters get dirty requiring less frequent filter replacements. Proper sizing needs to take many factors into account including the dirt loading, ceiling height, layout of your facility and more. We recommend contacting us and talking directly to an air cleaning professional to assist you in proper sizing and selection of your electrostatic precipitator or media mist collector unit. Model M73 mechanical filter unit pictured below features a 5 HP backwards inclined blower wheel and two stages of filtration to provide long life and low operating cost. The F73 Fume Extraction Systems, one of which is pictured below, feature washable electronic filters which are designed to be permanent, eliminating the need to purchase replacement filters. AQE4000 ambient dust collector pictured below features a self-cleaning feature which uses compressed air to “reverse pulse” the cartridges extending their service life. Request a quote here on an ambient dust collector system for your facility. Look here for a list of parts for air cleaners used to clear nuisance and process dust.